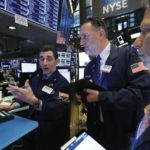 The sell-off in stocks was most pronounced in sectors that have shown strong gains over the last two months, including health care and technology. Financial stocks also took heavy losses. The world’s two largest economies have pulled back from an immediate escalation of their damaging trade war since they started negotiating last month. President Donald Trump postponed a deadline for raising tariffs on more Chinese goods, citing progress in a series of talks. Now, media reports say the nations could strike a deal this month. Homebuilders, including PulteGroup and Lennar, rose following a report that showed 2018 was a record year for construction spending. AT&T fell after it said it will reorganize its WarnerMedia unit. KEEPING SCORE: The Dow Jones Industrial Average fell 236 points, or 0.9 percent, to 25,789 as of 3 p.m. Eastern Time. The average was briefly down more than 414 points. The S&P 500 index dropped 0.6 percent and the Nasdaq composite lost 0.4 percent. The S&P 500, a benchmark for many mutual funds, is still up 11.2 percent so far this year. NOT FEELING WELL: Health care stocks led the sell-off among companies in the S&P 500. WellCare Health Plans dropped 15.3 percent. MEDIA MAKEOVER: AT&T slid 2.9 percent on news the telecom company is reorganizing its WarnerMedia unit, which includes HBO and Warner Bros.
ZOMBIE COMPETITION: Children’s clothing retailer Children’s Place gave investors a dismal forecast after reporting a disappointing fourth quarter. The stock skidded 11.3 percent. The main issue is competition from dying competitors holding liquidation sales. Rivals Gymboree and Crazy 8 stores have been in the process of shutting down, which means liquidation sales and better deals for shoppers. “We have never experienced a total liquidation of a direct competitor of the size and proximity of Gymboree,” Children’s Place CEO Jane Elfers said in a prepared statement. HOMEBUILDERS RISE: PulteGroup, Lennar and other homebuilders rose after a government report said 2018 was a record year for construction spending. The Commerce Department reported that construction spending rose 4.1 percent to $1.3 trillion, marking an all-time high. Spending edged lower in December, though, reflecting slower growth within the wider housing sector. PulteGroup rose 3.5 percent and Lennar gained 1.1 percent. BIOTECH BUMP: Gene therapy developer Nightstar Therapeutics vaulted 66.4 percent after biotech giant Biogen offered to buy it for $877 million in cash. Nightstar is developing treatments for rare eye conditions. Biogen and other large drug developers have been trying to expand their portfolios to include gene therapy and treatments for rare conditions. Those treatments are expensive to develop, but command better prices if they make it to market.